I’m going to be working with an eight-year-old to teach him long and short vowel sounds. I know him fairly well, so I know he’s into Lego, and computers and art. So I’ve come up with some activities that take advantage of those interests. I’m going to start by asking him (ahead of time) to make a big S and L from Lego. That will give us our categories – long and short vowels. After every drawing, I’m going to have him put it under the Lego L or the Lego S, depending on whether its vowel is short or long. We’ll discuss each one as we go. And at the end of it all, I’m going to teach him a “trick” about the silent “e” (how it makes vowels long) – and I’m hoping I’ll be able to bring a silent e made out of clear plastic. Oh, and before we start, I’m going to talk to him about nicknames (he loves nicknames). I’m going to discuss how every vowel has a “name” and a “nickname.” In other words, the long sound that is the vowel’s name, and its short sound, that is its nickname. I think that should be a good 20-minute first lesson, don’t you? Update: The lesson went really well. He caught on really quickly. At first he didn't want to do the lesson at all, but his parents persuaded him. After we chatted for about two minutes (mostly about Star Wars), he was fine with it, and even enthusiastic. Used the walk over to my house to talk about "nicknames" for letters - boys learn best when they're able to move their bodies at the same time. He got the concept immediately. Afterwards, instead of cookies, we played checkers. We're both looking forward to next week. I have to think of a reward, after the lesson's done. Maybe we'll play with the Lego. Yeah, who am I kidding - more likely I'll bring cookies! 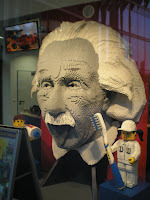 Oh, and that picture is Einstein built out of Lego (from Wikimedia Commons). Rather fitting, I thought, don't you?